Author Dan Callahan (photo/Edward Vilga). 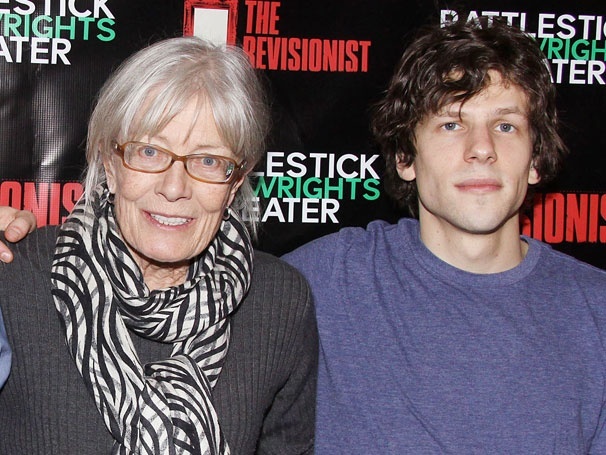 There have been a number of books about Redgrave and her illustrious acting family including The House of Redgrave by Tim Adler (2013), and The Redgraves: A Family Epic by Donald Spoto (2012). Callahan skillfully stakes out territory for himself in Vanessa: The Life of Vanessa Redgrave by focusing on the actress' busy professional life. He offers an enormously entertaining and insightful critical review of her long and varied career. 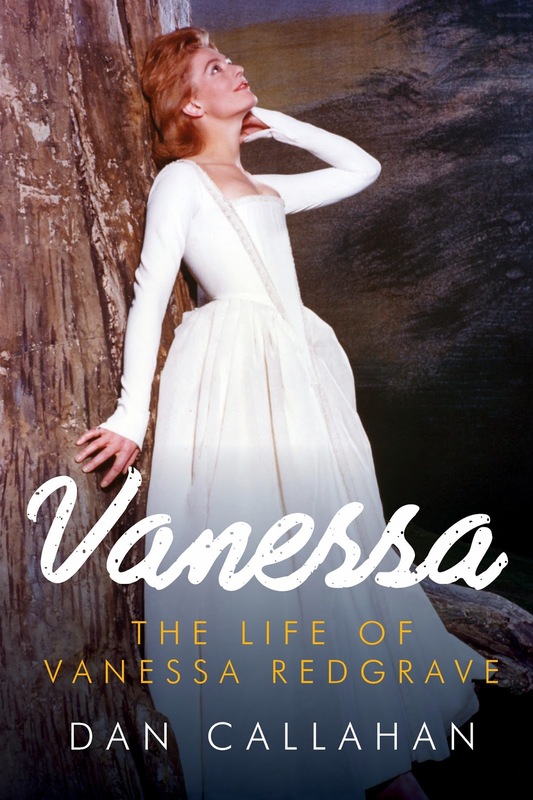 Redgrave's autobiography, simply titled Vanessa Redgrave: An Autobiography, was published in 1994. "It’s an odd book," Callahan told TCR in regard to the autobiography. "There is a lot of information, but it seldom feels like the right information in the right place at the right time, if that makes sense. She skips over things a lot. And then she will linger over things that don’t seem at all important, particularly towards the end. So it is, I think, unsatisfactory in many ways. That’s part of why I wanted to do my book." Redgrave with Richard Harris in Camelot, 1967. For more than half a century, Redgrave has worked steadily, bouncing between stage, screen, and television, doing superb work in each medium. Her left-wing political activism has at times, especially during her association with the Workers Revolutionary Party in the 1970s, captured as much attention as her numerous acting assignments. "It was the work that fascinated me, and there’s so much of it," Callahan explained to TCR. "As far as her private life goes, I didn’t want to pry. I think there are some things that are none of our business unless the person involved wants to share it. On the other hand, when it came to her politics, which have been very public, I felt free to press as much as I wanted." Redgrave with Jane Fonda in Julia, 1977. After concentrating on stage work in the earliest years of her career, Redgrave earned an Oscar nomination for her first major film role, that of a young London socialite pursued by her working class -- and perhaps insane -- estranged husband in the absurdist comedy Morgan! (1966). Leading roles followed in big time productions such as Camelot (1967), a screen version of Lerner and Loewe's Broadway musical; Isadora (1968), with Redgrave as famed dancer Isadora Duncan, and The Devils (1971), Ken Russell's outlandish adaptation of Aldous Huxley's novel of hysteria in a seventeenth-century French convent. But fully-fledged movie stardom never quite happened for Redgrave. Playing for Time, TV movie, 1980. "I think that Redgrave had the potential to be a major film star in the late 1960s and early 1970s," Callahan told TCR. "My feeling is that she deliberately distanced herself from that possibility. I don’t think that she ever thought about this consciously, but I think that the wellspring of her creativity comes from feeling like an outsider, or outside the mainstream. In the 1970s, when she was consumed by working for the Workers Revolutionary Party, I don’t think there were too many film roles for women that she could have played. And then in the 1980s, Meryl Streep took all the roles she might have played. I think it’s partly her, but it’s also partly the time she was a young actress. She has always found her most challenging work on the stage, and later on TV. You may need to look for her best work, but it is there, and it is still outstanding." In sorting through Redgrave's fabulous hodgepodge of a career, Callahan found two of her greatest performances came in relatively modest films made for American broadcast television -- Playing for Time (1980), featuring Redgrave, her head shaved, her face scarred, as one of a group of female musicians in a Nazi death camp who stave off the gas chamber by forming an orchestra to entertain their captors; and Second Serve (1986), starring an unrecognizable, dark-haired Redgrave as the transgendered tennis star Renee Richards. Redgrave unrecognizable in Second Serve, TV movie, 1986. Another outstanding performance came in the "1961" segment of If These Walls Could Talk, Part 2 (2000), a cable television movie offering stories about lesbian couples in three different decades. Redgrave played an aging woman who, after the death of her beloved longtime partner, is brushed off as irrelevant by the partner's family. In his book, Callahan calls Redgrave's work in "1961" a "master class in acting" that is "purely didactic, purely felt, and pure Vanessa Redgrave at her empathetic best." Callahan's admiration for Redgrave does not prevent him from pointing out instances where her formidable instincts seem to have gone astray. Of a 1988 American television version of Robert Bolt's play A Man for All Seasons, starring Charlton Heston as Sir Thomas More, Callahan says Redgrave's portrayal of More's assertive but uneducated wife is done in the manner of a "schizophrenic llama." Into Night, New York, 2003. Redgrave's eagerness to keep busy has led to her involvement in projects of dubious value ranging from appearances in incomprehensible European art films in the late 1960s to voicing the role of a talking dog from outer space in the movie comedy Good Boy! in 2003. In his book Callahan notes that is it is characteristic of the up and down nature of Redgrave's career that soon after completing the talking dog role -- "at this very lowest point in her filmography" -- Redgrave signed on to play the "most testing and difficult theater role of her career," that of Mary Tyrone in a Broadway production of Eugene O'Neill's classic drama Long Day's Journey into Night. Redgrave in The Ballad of the Sad Cafe, 1991. Callahan concedes that Redgrave's lavish talents do not include a gift for comedy. "She can bring tremendous joy and gaiety to a scene, and she can be very ethereal...she can be 'light'...But she isn’t funny," Callahan told TCR. "I don’t think I laughed once the whole time I was watching and writing about her. It’s all very serious. But that’s all right. Lots of other people are funny, particularly her rival Maggie Smith. Not many other people can be as intense and romantic and imaginative as she can be." Among Redgrave's finest screen performances is her turn as the mannish, slow-witted Miss Amelia in The Ballad of the Sad Cafe. "In her best work, and Miss Amelia definitely counts among her best, Redgrave's performances are made up of almost nothing but risks...Her total immediacy, yoked to a huge imagination, is an exceedingly rare quality on stages or screens," Callahan writes in his biography. Actor and director Simon Callow directed The Ballad of the Sad Cafe, a little-seen 1991 screen adaptation of the Carson McCullers novella. 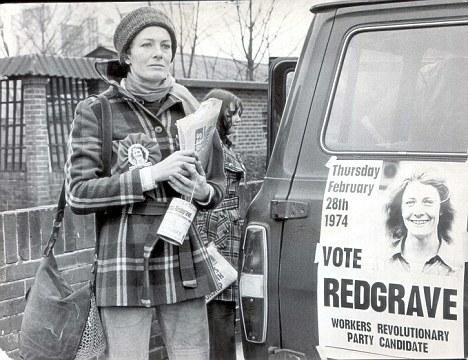 Redgrave campaigning for seat in Parliament, 1974. "I wanted desperately to interview Simon Callow," Callahan told TCR. "I wanted his insights. Callow’s critical biography of Charles Laughton was a great inspiration to me. It took a while to set up a phone interview, because he is very busy, and I started to think I might not get it; he had to cancel once. But then finally I did get it, and he was so insightful, so sensitive, that some of his thoughts about her are at the end of the book, too." Callahan is also the author of a book on classic Hollywood star Barbara Stanwyck (Barbara Stanwyck: The Miracle Woman, 2012). Is it more difficult to write about a living and still very much active subject? war rally, London, 1968 (photo/AP). "Yes, I would say so," Callahan told TCR. "I didn’t really picture [Redgrave] reading [the book]. If I had, I don’t think I could have gone forward. She requested a copy of the book shortly after it was published. Though I haven’t heard anything more from her, her agents wrote me a nice, brief email thanking me for sending the book." At first Callahan sought Redgrave's cooperation with his biography. "I sent her a letter telling her I was planning on doing a book. I had a vague hope that I might get a response, but I didn’t," Callahan says. "To be honest with you, once I started, I knew I didn’t want to talk to her. She’s very intimidating, and there is no way I could have done an honest book if I had been influenced by her in any way, particularly when it came to writing about her years as a member of the Workers Revolutionary Party." Daisy, New York, 2010 (photo/Rosegg-AP). 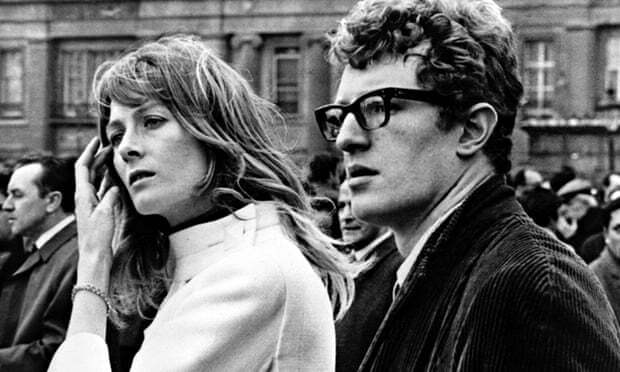 In the early 1970s, Redgrave joined the Workers Revolutionary Party, a cult-like British Marxist group, at the encouragement of her brother Corin, a political activist and sometime actor, who died in 2010. Vanessa and Corin, Callahan says, were "about as close as a brother and sister can be...By all accounts, Corin was the biggest influence on her political life. They had a kind of pact with each other that didn’t let anybody else in, and that went back to the time they were kids. There were many times, as I was writing this, that I wished that that hadn’t been the case." The WRP broke up in the 1980s after its domineering leader, Gerry Healy, was accused of sexually abusing female members of the party. Both Vanessa and Corin remained loyal to the discredited Healy. "Well, I must admit, there were times when I was researching [Vanessa's] time in the WRP when my heart sank," Callahan told TCR. "I would be talking to someone who had been in the group with her, and they would be telling me her attitude then, and the way she related to the group’s leader, Gerry Healy, and I would be surprised and saddened. But that didn’t last too long. She moved past all that. And I must say, I love her work more than ever. I still can’t get enough of it." Thank you for sharing the post and the interview. Towelroot is an Amazing Android Rooting app. Because of policy violations and not following the guidelines of rooting, Google has removed the Towelroot app from the Play Store. But, there are several online web sources and the official website itself provides Towelroot APK Download latest versions to download and Root your Android Phones. Great one. Thanks for sharing. These Kroger Stores are one of the best stores for the happiness and satisfaction of the clients and customers. Kroger Customer Feedback Survey With special offers and discounts as a part of their amazing retail sales strategy, the Kroger Stores always manages to capture the attention of the customers. Phenomenal Blog! I should thank for the endeavors you've made in composing this post. I'm trusting exactly the same best work from you afterwards too.